If you're feeling a mite parched and find yourself at a bar on the edge of the 'Verse, you'll probably get your tall, cold brew in glassware like this. Browncoats know this is the real deal: sturdy pint glasses that might just withstand the knock-down, drag-out chaos of your typical bar fight. 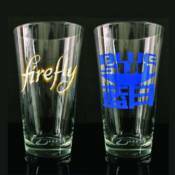 Featuring the logos of Firefly and Blue Sun, these pint glasses are bound to make your beverages taste extra special!